(tripod) upon which to put shelves. Each foot comes with a set of arm stabilizers on either side which when the arms are inserted will hold the arms steady and in place during displaying. Each foot is reinforced to make it even stronger for heavier items. that comes with every display stand shelf that is wider than the foot holding the arms. noticeable veining, etc. But you also hide and protect your display stand by having it painted Black, White or Tan, the colour most closely resembling wood but without all the markings. 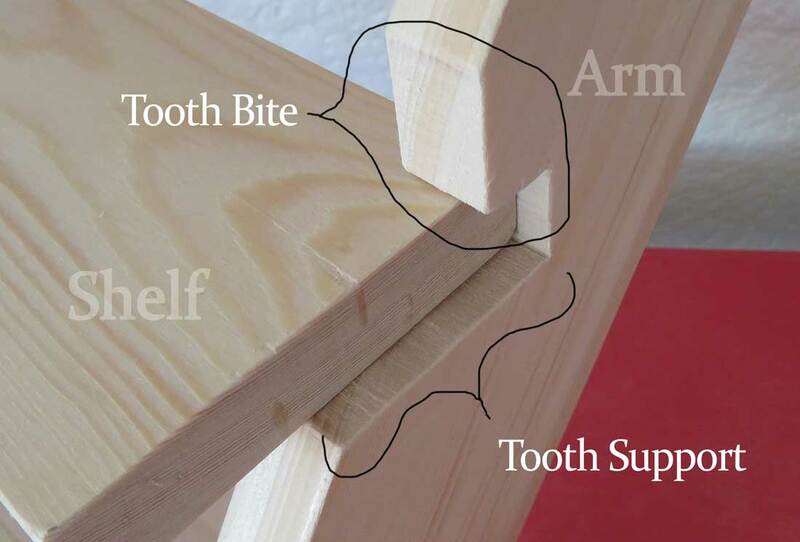 support” which you use to gently slide your shelves into place. 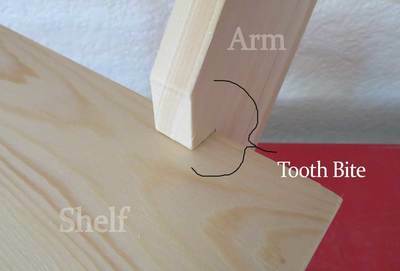 On top there is a minimal “tooth bite”, just enough to hold the shelf in place and still give you maximum space to put your product on. 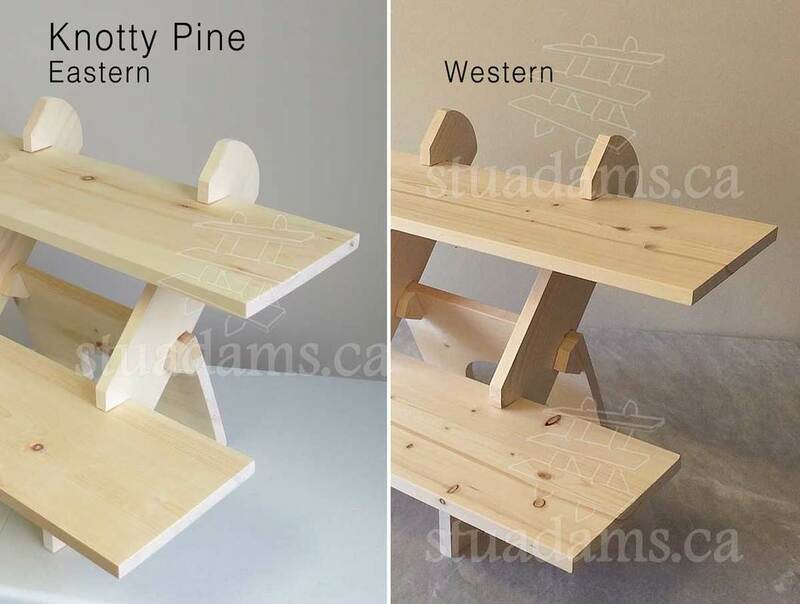 Well it’s a softwood lumber, specifically the kind I use for making my display stands is a variety of Western White Pine (Pinus monticola) or what I used to use which was Eastern White Pine (Pinus strobus). I’m certainly not an expert and this page is meant generally to familiarize customers with the nature of the wood that is being used in my display stands. To prepare you for what many consider beautiful examples of nature wood imperfections. Knotty Pine, is as the name suggests, a wood board containing many knots. It is not a species of tree specifically, but a condition that is common to many species of pine tree. Having worked for a few years now with both Eastern and Western Knotty Pine tree species, I have noticed specific differences. ​Eastern (which is what I started out with in Peterborough, ON), has less prominence in the knots both in the amount, coloration and sizing. It is also softer, although not noticeably different in weight. Western (this is what I’m working with now in Edmonton, AB), definitely has larger knots and the boards can vary substantially in weight. The grain seems tighter and the boards are generally stronger. 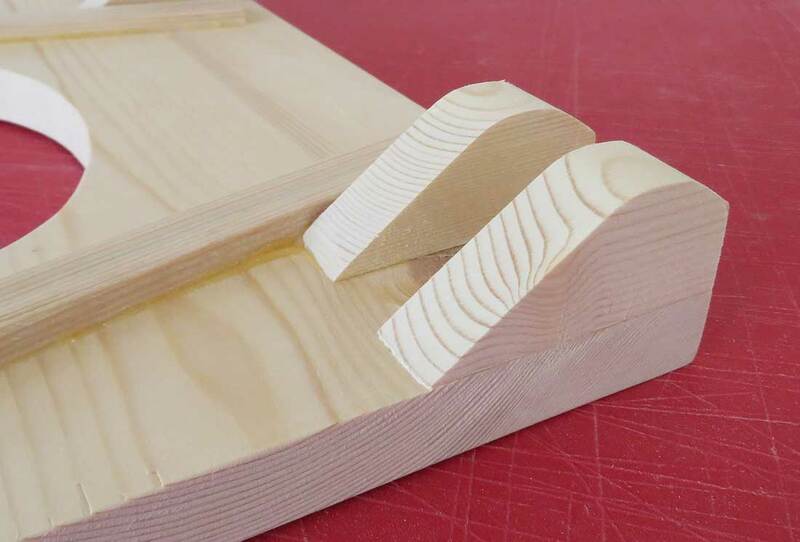 Either kind contain micro-fractures in abundance, which although it allows for easy working and cutting of the boards due to the soft nature of grain, it also makes them susceptible to cracking, warping, chipping and twisting. ​Where possible, I will take out the roughness or splintered wood and smooth out the edging as much as possible. I don't select the pieces for their uniqueness, Knotty Pine comes that way. It’s easy to work with, to form, is available in abundance and is relatively cheap. For most crafters exhibiting at trade shows, or for showing at craft fairs from a couple times to 30 shows a years, this wood is particularly useful because it is light weight, sturdy, strong enough in thickness to hold a substantial amount of weight without breaking or bending. The display stands will also hold their shape very well over long periods of time (years). 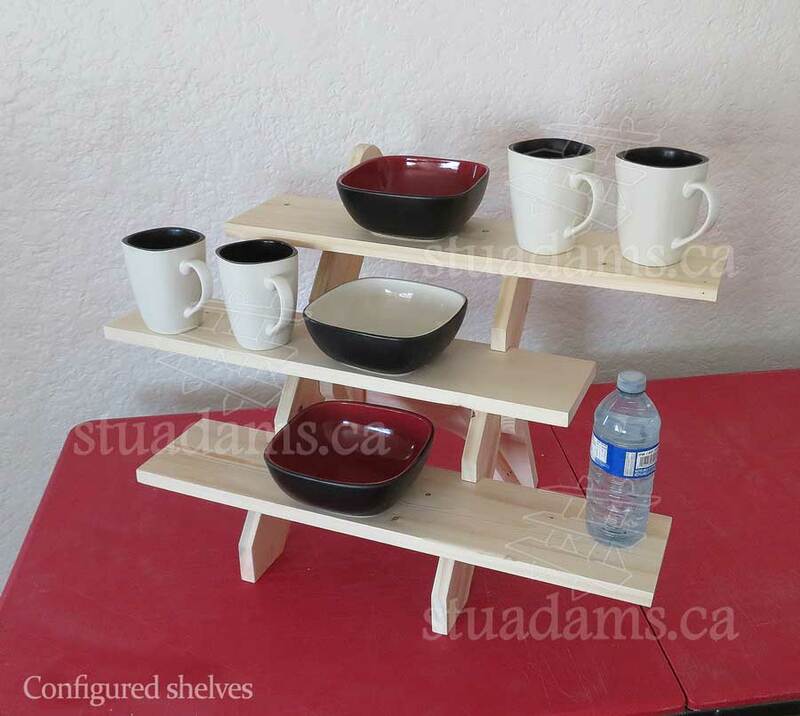 Although they are not museum pieces, they do represent a very economical solution to getting one's product up and visible at craft shows, and fairs and trade shows. If you have any questions or can add some input here for clarification, please let me know using the contact form link.